The Metropolitan Asylum Board (MAB) originally used some of its other London hospitals for smallpox cases, but this was met with opposition from local residents. The lack of hospital beds meant that whole streets were marked off with plague flags, the isolation of cases was impossible and epidemics difficult to control. The MAB was formed due to changes in the Poor Laws which meant that each area was responsible for its infectious sick, insane and destitute. The workhouses were full and many places were taken by the sick and insane. The reformed Poor Laws charged the unions to provide separate accommodation for these peoples. The MAB covered the area we know as Greater London; the City of London already had its asylum at Stone. It was one thing to create the MAB and quite another to get it going properly. Injunctions abounded and the only happy people were the lawyers, so long as they hadn’t got smallpox. The trouble was that no one wanted as neighbours the smallpox hospitals that the newly formed MAB were empowered to build by the Metropolitan Poor Act of 1867. For instance, Sir Rowland Hill (of penny postage fame) and other Hampstead residents, sought to recover damages from the MAB for nuisance arising from the use of the hospital at Hampstead for smallpox… and in 1878 they obtained an injunction to close it. A long legal wrangle ensued, until finally in 1883 the board was empowered to use the hospital for smallpox, but undertook to limit the number of cases under treatment to 40, a drop in the ocean in epidemic times. In 1880, thirteen years after the MAB came into being, everyone was still arguing about ways and means. There was a new outbreak of smallpox and the hard-pressed MAB came up with a solution – tented camps. On 7th May 1881, it was agreed that 300 acres of land belonging to the MAB (the site of the Darent Valley Hospital) could be used for a smallpox camp, and one week later on 14th May, 137 patients were located there in tents. It was the MAB’s own land so no-one could argue, certainly not the inmates of the new Darenth Schools and Asylum for infants and children, with whom they were sharing the site. The camp did cause some problems for the Darenth Schools; they were about to open their new blocks when the smallpox cases arrived so the opening was delayed. As autumn arrived it became too cold for out-door-life, the camp was struck, and the patients moved into the new blocks. All the staff and imbeciles at the Schools were revaccinated against smallpox and there were no reported cases of smallpox in either staff or imbeciles. When the MAB tried to open smallpox camps again in 1883 it was different. In May they purchased the Gore Estate from a Mr Morton, for £13,175, and a small strip of land from the Church Commissioners (Long Reach). It was on this land at Gore Farm that they set up the second smallpox camps. The Dartford Board of Health and local brewer and landowner Mr T H Fleet of Darenth Grange reacted quickly, but Mr Fleet’s attempt to obtain a restraining injunction failed. The patients, from London, were transported direct from Deptford hospital in hired four-in-hand vehicles, which covered the 18-mile journey in 3 hours. This was the first time a systematic transport service for patients had ever been used in London. The MAB then chartered from the Admiralty the 90-gun ship Atlas and a 50 gun frigate Endymion and adapted them for smallpox cases and they were moored off Greenwich. The Asylums managers were still not satisfied. There were still not enough smallpox beds available so they purchased the Atlas and Endymion from the Admiralty. They also acquired the Castalia and equipped her as a hospital ship. The Atlas was used for males and had three wards. A lift gave access to the wards and inter-ward communications were carried out via a ‘speaking tube’. There was one bathroom to each ward, six small isolation wards and a mortuary. The Endymion was moored in the middle of the three ships and was used for administration, stores and staff quarters. The Castalia had originally been built as a cross channel ferry but the design had been unsuccessful. It had ward blocks built on its decks. The ships provided another 350 beds. (The cost of acquiring and fitting the ships totalled £96,000.) The ships were now moored off Long Reach. Land opposite the ships was purchased (Long Reach) on which a laundry and extra sleeping accommodation for the nurses was built as well as a house to contain the engines and dynamos for electric lighting. Additional land was purchased at Darenth (Gore Farm) from Mr Morton and an additional strip from the Ecclesiastical Commissioners (1 acre, 3 roods and 1 pole between the land from Mr Morton and the roadway) for £125. The second smallpox camp was erected here and plans put into place to build ten 100-bedded blocks (Gore farm Hospital). Next, two paddle steamers were bought for £10,000 and fitted as ambulance ships. A pier was constructed at Long Reach and wharves at Rotherhithe, Blackwall and Fulham at a cost of £42,000. Each wharf had an examination room and an isolation ward for patients unfit to make the journey and another ward for cases of doubtful diagnosis. 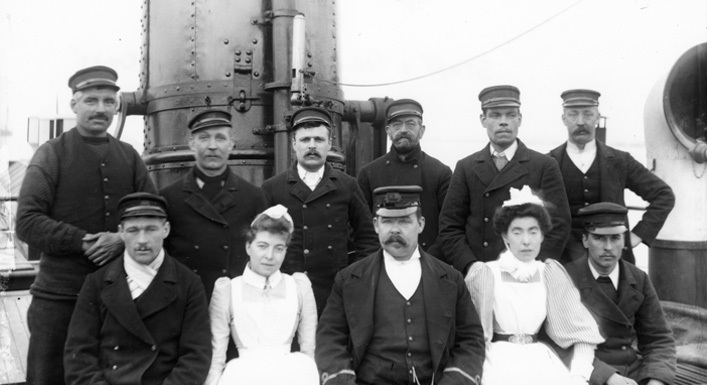 In October 1890, the hospital ships were supplemented by a permanent convalescent hospital at Gore farm. Later, in 1901, Long Reach Hospital was built and the following year the Orchard Hospital (although by this time smallpox numbers were dwindling and it was never used for this purpose). The ships were coming to the end of their useful life and it was decided to build a permanent smallpox hospital – Joyce Green, which opened on 28th December 1903. The ships were sold for scrap shortly afterwards.